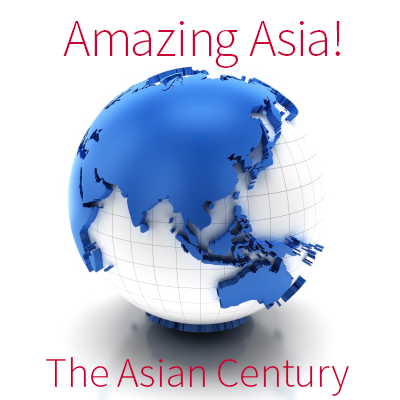 Around Asia: What's Going On? Japanese robot makers are learning to yodel. FANUC and Yaskawa Electric, for the second year in a row—with a hearty thank you to China—beat out European robot giants ABB and KUKA in the all-important category of profit margin. As reported in the Nikkei Asian Review, FANUC rocketed to an amazing net profit-to-sales ratio of 24 percent while Yaskawa rang in at a more-than-respectable 10 percent. ABB’s margin is forecast at 7 percent, KUKA’s at 4 percent. Key factor for the Japanese producers’ wider margins is that both have in-house production capacity for critical core robot components like servomotors and inverters, says Morgan Stanley’s Yoshinao Ibara. Sales to China accounted for $751 million out of Yaskawa’s total of $3 billion in sales. 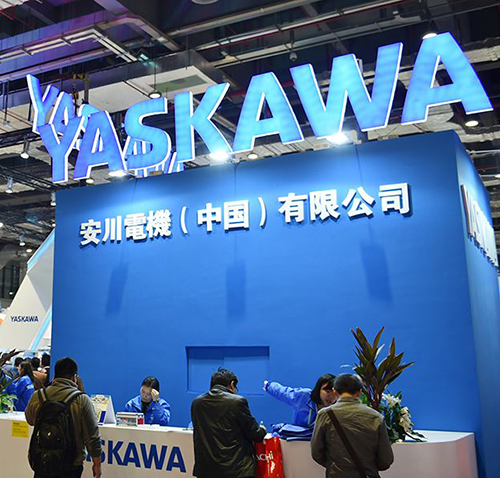 Yaskawa now wants to lift its global market share well above its present 10 percent, and supplying robot parts to Chinese rivals is the means. With China possessing barely one percent of the world’s robot patents, dependence on Japan (and Europeans) will continue for the near term; and, of course, Yaskawa intends to use its IP advantage for as long as possible. Additionally, Yaskawa’s joint-venture robot plant at China’s Wujin High-Tech Industrial Zone, Changzhou City (opened in 2013), is operating at capacity. Yaskawa looks primed to easily build on its 10 percent share. FANUC, with a massive commitment to cellphone assembly equipment, is predicting a major downturn from its sky-high 24 percent as phone sales soften. Although robots sit at number two on China’s top ten ‘must-have’ list for Made in China 2025, the country’s domestic robot industry, although having made remarkable strides since 2013, cannot keep up with the frantic pace of factory automation. Foreign robot producers look well-ensconced to maintain their edge; Japanese quality, abundance, ease of access, and business acumen are realizing huge profit days, with many more ahead. With cobots, the playing field is much more level; China has three superior cobot makers that can easily compete or out-compete any foreign cobot: AUBO, Elephant Robotics, and Han’s Robot. Given China’s two-million-plus factories, especially hundreds of thousands of SMEs, plus plump government subsidies for industrial robots, plus a hometown edge of being China’s own, the domestic cobot advantage is China’s to lose. As Seeking Alpha refers to them: Cobots: The PCs of the Robot Era. Add to that potential mega-market, China’s distinct advantage in artificial intelligence (AI), and the idea of the “smart” Chinese cobot begins to loom larger than life. None of China’s foreign robot producers can begin to match China’s AI chops; and five years from now it’ll be near impossible to find an “unsmart” cobot. Do the math; China would have to do something extraordinarily stupid to miss out on smart cobots. Standing on tip-toes on Japan’s Tsushima Island one can make out the coast of Korea, some 550 miles distant. With Korea’s very talented robotics ecosystem, quality manufacturers, and solidly mature robot industry—plus a very needy China—it seems a given that Korea should be basking in a chunky robot market with China…its next-door neighbor and largest trading partner. Sadly, that’s not the case. As a March headline in BusnessKorea splashed out: Robot Industry Competitiveness—South Korea Lagging Behind in Robot Industry. 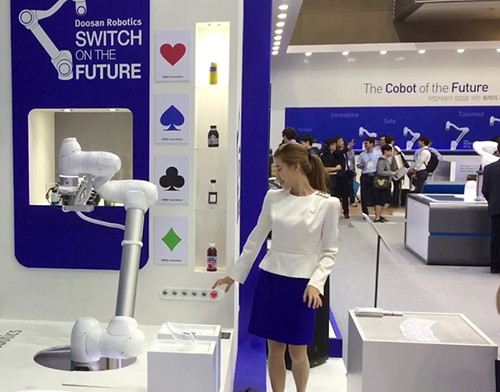 “The Korea Association of Robot Industry and the Industry-Academic Collaboration Foundation of Kwangwoon University announced on March 5 that South Korea’s robot industry is lagging much behind those of Japan, the United States and Germany. A country-wide survey of 87 of Korea’s robotics experts surveyed in five evaluation categories: price, quality, manufacturing, human resources, and technology, came away with scores ten points distant from the three leaders. All from a country with a robot to worker ratio the highest in the world. Upstart China, with one of the lowest ratios on the planet, bested Korea in three out of the four segments: specifically, manufacturing, personal service robots, and professional service robots. 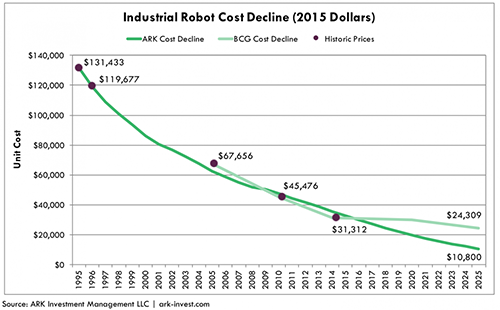 Last year, Asian Robotics Review carried the headline Korea Awakens, Reacts…and Accelerates; and that Korea’s robot sales were forecast to Hit $25B by 2022; and that Korea has been ready since it’s 2014 proclamation Intelligent Robots Development And Distribution Promotion Act to maximize its robotics prowess. It hasn’t happened…yet. Lots of distractions hampered Korea’s advances. The downfall of former Korean president Park Geun-hye (24 years in the slammer); rockets flying overhead courtesy of Kim Jong-un; and China’s displeasure with U.S. THAAD missile batteries on a Korean golf course. The latter earned Korea a boycott by the Chinese public on everything Korean from Hyundai SUVs to vacations to robots. A major financial ouch! Lone survivor, K-pop! Okay, Korea smudged out last year as an anomaly, and here in 2018, will try to begin again, if it can. The Ministry of Trade, Industry and Energy (MOTIE) has ponied up $467 million through 2020 to fund the Joint Robot Industry Development Initiative, which covers lots of domestic robot issues, but specifically tabs robots as “one of the new export industries”. Emphasis on “new”! With “smart” cobots, Korea has a wonderful opportunity to make it in China, or, for that matter, anywhere else. Doosan and Hunwha have excellent cobots at the ready; Korea needs now to push the market. Hyundai is partnering with China’s AI startup DeepGlint, which “specializes in vision technology and has developed a high-definition camera image recognition technology based on AI.” And it’s just not for automobiles! Korea should also look south to the ASEAN, especially its new best friend, Vietnam: Korea Adds Robotics to Smart Vietnam Strategy. A quick, two-hour, one-way flight over the Yellow Sea from Seoul to Shanghai costs $75 bucks. Shanghai, with over 24 million people, is the most complete city for robotics in China as well as the most concentrated area for the domestic robot industry. It boasts over 100 robot manufacturers and developers. According to Dai Liu, deputy chairman of the Finance Committee of Shanghai People’s Congress and the president of the Shanghai Robot Industry Association, “the output value of the entire robot industry in Shanghai increased by 98 percent year-on-year, which is equivalent to a doubling of the output value…the robotics industry is becoming a new bright spot in Shanghai’s industrial transformation and upgrading. Last May (2017), Shanghai created its own brand: Made in Shanghai. For $75, $123 round-trip fare on Korean Air, anyone in Korea can see firsthand in Shanghai what China is looking to build out across the country. Check out the factories, warehouses, the SMEs, the hospitals, care facilities, schools and private homes. Smart cobots should be the first takeaway for Made in Shanghai and for all of China. In addition to signing autographs for two hours at the annual shareholder meeting, Terry Gou had a few things to say about the future of technology. He said that the era of fast growth in the global mobile industry has passed and that Foxconn has been developing new businesses. “We are in the process of corporate transformation. The industrial internet-centric business will be a success. We invested heavily in research and development last year for the long-term growth catalysts. The next three years are too important to Foxconn. I won’t be retiring from the company in five years,” he added. See: Here Comes Foxconn: “Made in China 2025” Takes a Big Leap Forward. From yodeling Japanese to the prophesies of Terry Gou, robot-driven automation is firmly taking hold in East Asia, and due to spread south and southwest soon thereafter. It all began to take shape last spring. Take a peek back: How We Got to 2018: Blast Off in 2017. A special 5-part article series that looks behind the scenes at the most incredible transformation in history.